Obermumpf in Canton Aargau is a small village nestled among vineyards in the beautiful and picturesque valley of Fricktal. BnB Obermumpf is an ideal starting point hiking, bike tours, motorcycle tours, kayaking or canoeing on the Rhine, shopping in Bad Säckingen and city trips to Basel and Zurich. There are really many Things To Do close to BnB Obermumpf. 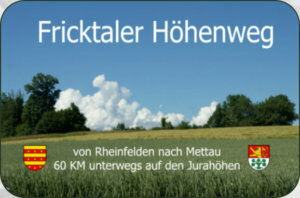 The Fricktal High Path tour for wandering provides an extraordinary 60km walking path in the Frick valley, nestled in the northwest of Switzerland. Extremely popular for hiking, this Swiss trail offers spectacular views through historic villages wrapped in hundreds of years in tradition. Very close to Bed & Breakfast BnB Obermumpf is the internationally known Parkresort Rheinfelden offering Thermal Saltwater Baths, Indoor & Outdoor Saunas, Fitness Center and Beauty Treatments.